I really loved its stunning visualisation of life by numbers in The Human Footprint. I wish they showed those images in the Human Footprint Calculator. There are some numbers and images available online. 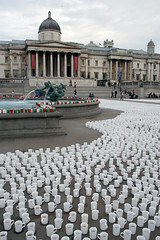 How did they lay out 75,000 cups of tea in Trafalgar Square? Watch this. While Paris and other Europe cities organised “Five Minutes of Respite for the Planet” on the eve of the release of the 4th Intergovernmental Panel on Climate Change (IPCC) report on climate change, Switched On London, a lighting festival, is taking place in the Pool of London, between Tower Bridge and London Bridge on the Thames. This is a seven night celebration of the relationship between light, architecture and the city consisting of temporary lighting installations and a series of light related events with an overall concept theme of ‘theatre’. So, the ‘Gods of Light’ willing, London’s first festival of light will run from the 8th to the 16th February 2007 in conjunction with ARC 07 at the Business Design Centre. The project uses 320 LED light strips, each one of which only uses about 8 watts of electricity. Over the ten days of the festival, it’s estimated that the running cost will be only £20.00 – less than many Londoner’s electricity bills. Okay, let’s enjoy it. I hope that they will light you up a bit during the dark depressing winter. It would be perfect if they were powered by solar or wind. Lighting is essential in our modern society. What we need to consider is its use in the right place at the right time in the sustainable way. 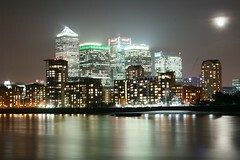 Personally I would like to see London switched off for a short period of time next. Sydney is going to turn off their lights for an hour, Earth Hour, between 7.30 and 8.30 pm on 31 March 2007 to reduce their greenhouse gas emission from light pollution [via TreeHugger]. I wish them great success and hope someone takes satellite photos at that night. Via Starry Night Lights, I found a fantastic Earth at Night image created by Earth Observatory at Nasa. There are many fascinating images at Nasa’s Astronomy Picture of the Day. It’s a shame that they don’t have a rss feed. I am delighted to see quietrevolution wind turbines and Smart cars in a picture of “House of the Future” in thelondonpaper. The picture is what the average semi-detached house will look like in a 2106. This is a study from Zurich UK. Hmm, but in 100 years? I will second a comment from Simon Reddy of Greepeace. We should be reducing the energy demands of existing buildings rather than wait 100 years. Arup, the designer of house of the future, predicts its design will become the norm with stamp duty exempt on green homes. I don’t think so. It’s still too expensive to install these technologies. Chancellor Gordon Brown’s announcement that he wants all new houses built by 2016 (in 10 years!) to be “zero-carbon” appeared to take the industry and other government departments by surprise. I am also disappointed that Micro-CHP (Combined Heat and Power) is not mentioned at all in the study. I am the proud owner of Smart ForTwo, on which more later. I am jealous as I have to wait until 8th December here in UK. I might try it out before the release. Oh, any chance of having cricket instead of baseball in Wii Sports in UK? Maybe not. Originally, I wanted a machine that would cost $100. My idea was to spend nothing on the console technology so all the money could be spent on improving the interface and software. If we hadn’t used NAND flash memory [to store data such as games and photos] and other pricey parts, we might have succeeded. “Wiimote” is the motion-sensitive controllerfor Nintendo’s next generation console Wii. It brings totally new experience of not only video games but also interactive TV(including internet surfing via Opera browser). That is great, but the shape of Wiimote is still “remote control”, a long rectangle bar. It could have been made much smaller if they invested more in power source. Silicone fitting holding globes (in different sizes for children and adults) could make the experience more enjoyable. The name is great, too. Wii sounds like ‘we’, which emphasizes that the console is for everyone and spells with two “i”s to imply an image of players gathering together. Nintendo set out to reach beyond existing gamers and expand the market. This would involve simpler games that could be played for a few minutes at a time and would appeal to non-gamers or casual gamers (who play simple games on the web but would not dream of buying a console). They would be based on new, easy-to-use controls. And they would rely on real-life rather than escapist scenario. I foresee a great Wii success. But, on the other hand, in UK it has been claimed that a £10m drive to add wind turbines to public sites and to promote renewable energy is being funded by cuts to other green projects. That is shocking. Below is a 3D rendering of the Google project (from VentureBeat). It’s very dark grey and boring. Why can’t they make it more colourful by adding Google colours like ones (sun parasols?) in the centre of the image? Don’t worry. “Elegant wind power has arrived with the new quietrevolurion wind turbine“. The design is innovative and it’s even near silence. 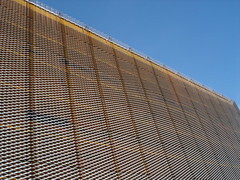 It can also become suspended video screens or colour-change lighting displays, thanks to LEDs integrated within the blades. An oddly named company, XsunX, based in California, is manufacturing “Power Glass“, a technology that allows glass windows to produce electricity via solar energy. Unleashing “Power of the Sun” for parking facilities is a good idea, but they are ugly. It could be a combination of “Power Glass” transparent roof and quietrevolution wind turbines with adverts. Most of recent skyscrapers are energy efficient, but they will even be able to generate more energy than they need with technologies like these without spoiling visual effect in the near future. I am a big fan of Businessweek’s slide shows. Here are a few of them on this topic. Channel 4 showed a short program after today’s news at 7pm introducing this year’s finalists for Royal Institute of British Architects Stirling Prize. I will vote for Evelina Children’s Hospital, which is part of Guy’s and St. Thomas’ NHS Foundation Trust , one of the largest NHS Trusts. I’d never liked hospitals – well who does? But, everyone will, no doubt, love this hospital. The hospital serves a diverse community – over 140 languages are spoken locally – so, for practical as well as aesthetic reasons, colour, symbols and themes from the natural world will be used to help people find their way around. Children worked with a story teller to come up with the themes for the seven storeys. These are: ocean, arctic, forest, beach, savannah, mountain and sky. They also worked with a visual artist, Mary Evans, to help design the motifs for the floor tiles which relate to each theme, such as shells and crabs for the beach. Art and installations have been commissioned to help entertain and distract children during their visit or stay in the hospital. These include a helter-skelter in the out-patients area and an interactive ‘teleporter’ video piece that will stimulate children of all ages with its video trickery. Other considerations, such as a ‘snake floor plan’, rather than long, straight hospital corridors generate a more informal feel and separate the open, multi-bed wards from the utility spaces and single bed rooms, as well as breaking up the size and shape of the bed bays. Previous winners are controversial IMHO. Scottish Parliament building, which was completed three years late and 10 times over budget, was the 2005 winner. Gherkin, which some people see ugly and may be sold off soon, was the 2004 winner. P.S. I just missed a fantastic Open House London this year, which opened over 600 buildings, many of them are normally closed for the public, completely free of charge. I can’t wait for the next year’s event.